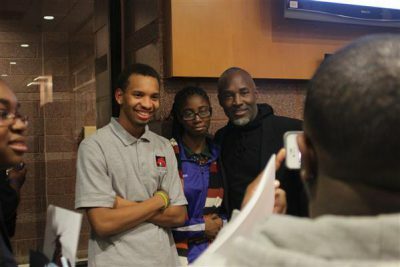 Washington’s THEARC (Town Hall Education, Arts Recreation Campus) hosted its 7th Annual Community Open House with special guest, renowned visual artist and dancer, Nick Cave, Wednesday, November 28, 2012 at 5:30 – 7:30pm. In partnership with Art in Embassies (AIE), U.S. Department of State, celebrating its 50th anniversary, this event featured a special Artist Exchange presentation and educational pilot that showcased students of the Corcoran Gallery of Art and College of Art + Design, the Levine School of Music, and The Washington Ballet @ THEARC. The public was invited to visit THEARC and see dance, musical, and theatrical performances, try out instruments at an instrument petting zoo, create a wearable piece of art, enjoy free refreshments, and more. Attendance was free.